Everything you need to take care of granite counters, walls, vanities and any other polished natural stone is right in this stone care kit . Quick and Convenient! 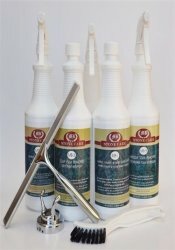 Clean your granite countertops with the Daily Spray Cleaner. Protect your stone with the Impregnating Sealer. 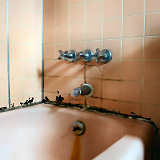 Maintain the cleanliness with the Soap Scum Remover. These products work great for your travertine, limestone, marble and granite care. Safe to use on Natural Stones including most Marbles. This Impregnating Sealer effectively inhibits liquids from being absorbed. It is a water repellent as well as an oil repellent sealer. Unlike other impregnators, this sealer does not require frequent applications. Apply it every 10 Years! 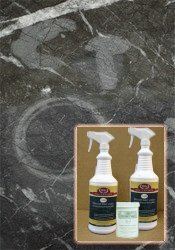 Take care of Granite counters with a safe daily spray cleaner! This is one of the most popular products! 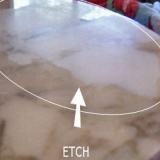 It quickly and easily cleans your Marble and Granite counters and surfaces. Just spray it on and wipe it off. NO Rinsing. NO Dulling Film. It's a must for the daily cleaning care of stones that have been sealed with a penetrating (impregnator) sealer. It's safe on ALL Natural Stones and surfaces. Since it's so popular, this kit includes TWO Bottles. 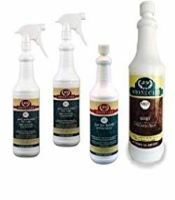 The countertop care & sealing kit is the very best product line available to the end user of Stone for the sealing, cleaning and care of granite counters, vanities, shower walls AND all other polished stone. Not for floors. I am impressed with service as well as the granite care items I ordered. HI, your products worked great and I will be buying all my cleaning needs from you. We will reorder from you when we run low. I should thank you guys for such a good product and great service.